I feel like it's grown too massive, both in comments and answers, so I wanted to make a thread to discuss here. For me, this question is quite arbitrary (see Eric Wofsey's highly-voted comment). The only argument I could see for leaving this open at all is Todd Trimble's comment that it might get some useful answers. But now it has 23 and I feel like that's enough. I'm thinking it's time to close, because this is the sort of question cranks love to answer. I'm sure that if it remains open it will pop up to the front page in the coming months with low-quality answers and will push new questions down the page. Furthermore, because the OP keeps editing to include others' answers, that also bumps the question. This really seems like it would be a better fit for a blog than for MO. Of course, once it gets closed it'll get votes to reopen and we may get into a tug of war. So this meta thread might come in handy. For now: does anyone have any reasons this should remain open? Well, I said let's not be too quick to close, and actually I think some useful and thought-provoking answers have appeared. But that doesn't mean I think you're wrong David -- my own plan is to watch this thread on MO carefully for signs of crankishness, and when some such answers appear, I can see myself casting a vote to close. But not quite yet. The only one I thought smelled a little bit crankish so far was one by "unknown (yahoo)", now visible only to those with 10k points -- and it's possible s/he was tongue-in-cheek. I didn't find "prime p, infinity, 2 (the oddest prime)", currently with 0 points, very convincing, but it didn't seem crankish to me either. The higher rated answers had some good food for thought. I have to agree with David White, Eric Wofsey, and others, who view the question as being too arbitrary. Or, more precisely, perhaps trichotomies are interesting, but with enough creative license, so many things can be squashed into the trichotomy mold that the question becomes meaningless. I tried to hint at this in the comment I left, about ends of groups; another example is the OP's description of the "trichotomy" of algebraic surfaces, which should really be a tetrachotomy. IMO this is one of the better list like question we have seen lately. Yes, it is a bit vague and arbitrary what qualifies. And, yes, that unknonw(yahoo) is a bit of a problem (sideremark for Todd Trimble: strange as it might be I am quite sure this is meant seriously). But, it produces some interesting contributions and OP put a lot of effort in. That it is edited to give an overview of contributions is very good in the long run as it will avoid duplicates. So, I am in favor of keeping it for a while and voted to reopen. Let us perhaps close some (pairwise ;D) different things instead. Just a few thoughts - first, I happened to be online when the question came out, quickly posted two answers and some comments too, and since then I've been following it, every time quite happy to see it bump again on main. In fact, I'm on MO for 2 months, and that's the very first time that I see/participate at a truly successful big-list question! It was a quite a nice experience, the first time since I'm here that I had the impression of contributing to something really useful. Btw, thanks everyone who had participated. I find the question page, as of now, quite beautiful, and even inspriring. 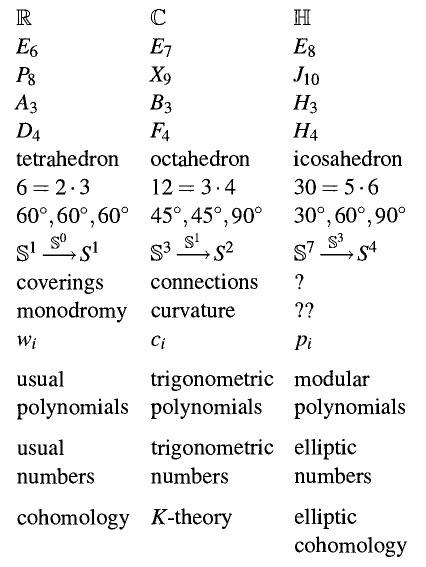 I suppose that I'm not the only one, but just scrolling up and down and contemplating all these different "3-ways" gives me a few new ideas and thoughts, connections between areas of math that I have missed before, and so on. So, please, in any case, don't delete! That's basically what I wanted to say; for the closing/reopening discussion now, no opinion, it's of course up to the community and especially up to those having 3K rep (I'm not among them), so good luck in taking the best decision here, most suitable for the users! Let us perhaps close some (pairwise ;D) different things instead. Yeah, one more question like those other two, and I'll be one of the first to pull the trigger to close. In any case, I hope no one is considering deleting this. I added the soft-question big-list tags, so that for people like me, who want to avoid seeing such questions, it is invisible. We could leave it as it is, close it, or delete it. Another trichotomy! I think this is a good question that was closed too quickly; So I vote to open (I was in the middle of preparing an answer regarding an important trichotomy in model theory.) Nice joke, Federico! This reminds of the joke about the 3 kinds of mathematicians: Those who can count, and those who can't. And no, I don't really have an opinion about the question itself. - By default we should close. - If we want to be nice: leave open. - And if we're in a bad mood: delete. Teo B, no one is suggesting that the middle column is necessarily the generic or standard behavior. For example, zero is not a generic real number, and genus one Riemann surfaces aren't particularly generic as far as Riemann surfaces are concerned. By the way, Vladimir Arnold was interested in the similar question, he called "math trinities"
Wow, this is cool! I'm adding this meta link to the question page, at my ADE classification answer.